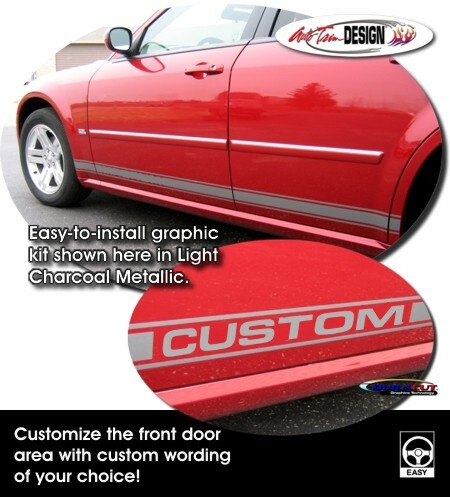 Set your '05-'08 Dodge Magnum apart from the rest with this classic body side stripe graphic set. Choose from a solid center area or customize it with unique wording on the leading edge of each front door. Simply enter the Custom Wording of your choice (up to seven  letters/digits/spaces) and we'll make it happen. Either way it'll look Terrific! Simple trimming required at door jambs and at each wheelwell. Graphic shown has been set just above lower body line at bottom of doors.